Expect a lawsuit for the multiple cardiac arrests I suffered. I almost pre-called the ambulance because I couldn’t fight off the feels. Thank you, Colleen Hoover, because you’ve done it again. She has finally wrecked my heart with her beautifully developed plots, compelling characters, and jealous-worthy romance. As I was reading this, I’ll be honest if I tell you that I didn’t curse Colleen Hoover. Reason#2: My tears turned my room into an ocean like my mop officially gave up around page 50. Reason#3: I think I need a therapist to cope with my withdrawals. Reason#4: Why hasn’t anyone invented a rewind button? Because I need it. I will love nothing more than to continue this rant of how Colleen Hoover demolished my entire existence with only 384 pages but it’s time to get serious. It Ends With Us, is entirely narrated by MC Lily Bloom. (You think that’s worse??? Listen, her full name is Lily Blossom Bloom. Bahaha are you for real??) Reading the back cover, you already know that something deep, personal and life-changing is going to happen. Lily’s life was never easy for major reasons but it didn’t chain her down. You get to witness how certain people and events impact her. You learn how these certain things shape and build her into the individual she is. Ryle and Atlas, dear lord, I don’t even know where to begin with them. I’m serious. I have no idea what to say but prepare yourselves for them. That’s all. I was aware that any book I pick up and read by Colleen Hoover will somehow shred my heart like a Tasmanian devil but I was totally unprepared for this. I literally went into this book thinking, I know exactly what’s going to happen. Was I right?? You already know the answer: A big no noooooooooo. Also, every page I read, I felt like I was being repeatedly hit by a truck. That’s the kind of impact this book has on you. 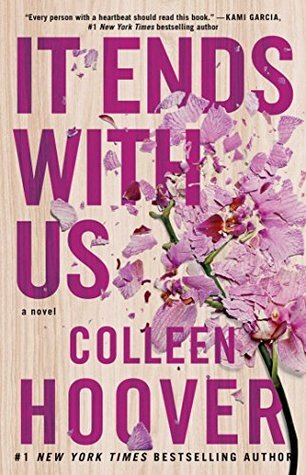 The plot can be interpreted in a lot of interesting ways but it was soooooooooooo far from what Colleen Hoover really had in store for us. She ventured out to a whole new level and I’m thrilled that she was able to produce something so beautiful yet life-changing. I learned lot from this book. I had the opportunity to step into someone else’s shoes and experience a story that is most likely hard to accept and understand in some parts of society.